I had never experienced what is was like to ride a horse. But as soon as I did, I loved it. Before all this happened, Dad, Gherty, and I were trying to get a cab to the horseback riding place. Soon we found a taxi, and the taxi driver took us to the horseback riding. The place was a plain little house and a lot of stables. It looked pretty deserted, but there were tons of horses. We were going to look if the owner was around and we ran into a German Shepard. He looked pretty nice, so Gherty and I touched him. After we did, we passed some cool looking horses. One had a white line down its face; the other one was jet black! Then there was what sounded like a wheel barrel. It turned out there was a man wearing riding clothes and he was rolling a wheel barrel full of hay. We said, “hello,” and he just said, “hi,” and walked off. Dad was looking for Mom and Quinn but did not see them anywhere. We finally decided to go ask the people if this is the right place. There was a woman with the guy, and they were helping a sick horse. The horse was huge and black. The man spoke little English, but the woman spoke some English. So, after we told them that we might have gone to the wrong place, they called a taxi. We hopped right in. So, this time we were going to the right place and we saw Mom and Quinn. We stopped and we walked to the horses’ stable. So that we don’t take long with this blog, my horse’s name was Arrow, and he did know how to stay on track. Dad’s horse was really funny, since he was always hungry. 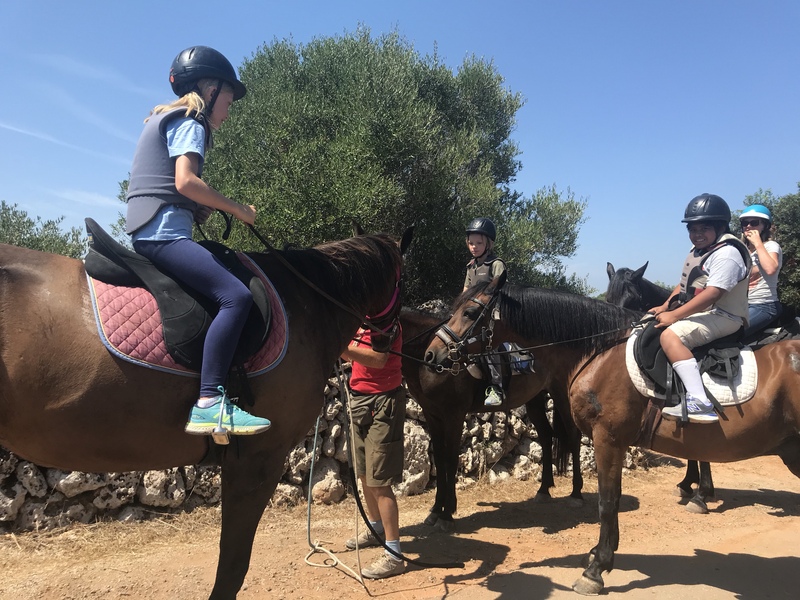 The horses’ times to eat from their point of view, are breakfast, brunch, lunch, snack, snack, snack, afternoon snack, dinner, bedtime snack, and midnight snack. After we got back, we dismounted and went to eat OUR lunch. This is the end of the blog. So bye!!!!!!!!!!!!! ← Quinn’s Blog on Spain2!